GitLab is web-based and open-source Git-repository manager. It comes in FOSS edition as well as Enterprise edition. GitLab is web-based and open-source Git-repository manager. It is written in Ruby and comes with plenty of features including code review, monitoring, CI/CD (continuous integration and deployment), wiki, issue tracking, and many others. Until the year 2012, GitLab and was fully free and open-source software distributed under the MIT License. In July 2013, the program was split into two versions: GitLab Community Edition (CE) and GitLab Enterprise Edition (EE). In February 2014, GitLab took an open-core business model. As expected, GitLab EE has some advanced features not present in the CE version. However, the GE version is still actively developed and supported by the company. 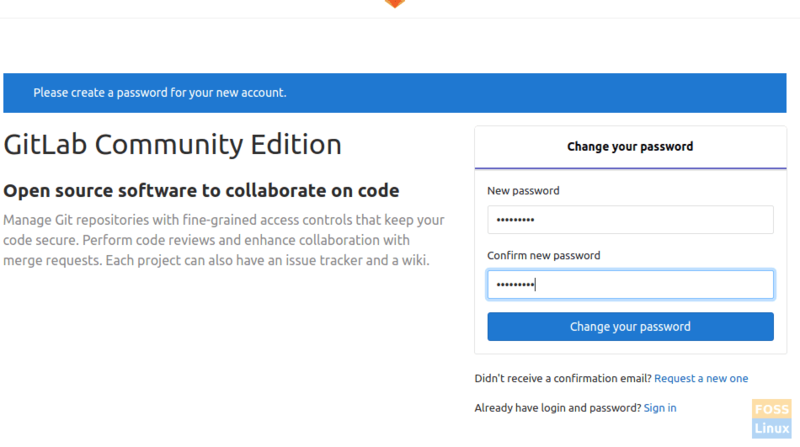 At FOSS Linux, we love Open Source software, therefore, this article will describe only the installation of the GitLab Community Edition (CE) on Ubuntu. To begin with, update system repositories before starting the GitLab installation. Gitlab will need to be able to send emails to users. Hence, you should install and configure email service such as postfix or you can use external email services like AWS SES, MailChimp etc. In this example, we will use postfx. 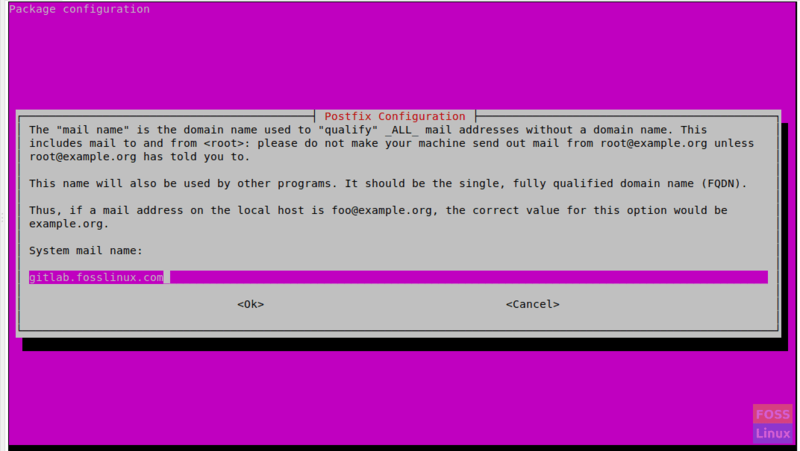 During postfix installation, it will ask mail server configuration type. Select ‘Internet Site’ and click “OK”. Then it will prompt to enter ‘System mail name’. This should be your server hostname or DNS name of your server. Here we use “gitlab.fosslinux.com”. Enter the appropriate name for your server configuration and press Ok. It may take some time for the installation to complete. Then you will get the following output. Before we access GitLab, we need to configure it with Domain name. But before adding this domain name you need to configure your DNS servers with needed configurations (a record with server Public IP). Then look for “letsencrypt” and uncomment the line. Set it to “true”. If you need, you can enable “letsencrypt[‘contact_emails’]” section too. Uncomment line and add your email address. Save and close the file. After this kind of modification, you need to reconfigure GitLab. So run below command to do that. It will reconfigure GitLab and configure free SSL certificate. Use your web browser and type your GitLab Url and hit enter. When you browse GitLab web interface first time, it will ask new password for the administrative account. Enter the new password and click “change your password”. After that, it will redirect to login page. The user name will be “root” and password will be the one you have already set. After you log into the account, you will see the welcome page. If you need to modify SMTP settings, modify “gitlab.rb” file. There you go! You installed and configured GitLab successfully.